Reimagined 2019 Kia K900 makes global debut at New York Auto Show. NEW YORK, March 28, 2018 /PRNewswire/ -- Kia Motors America (KMA) today unveiled the completely redesigned Kia K900 sedan at the 2018 New York International Auto Show, establishing a new standard for luxury. The all-new second-generation model combines a dignified and sophisticated exterior design, a beautifully crafted cabin of premium materials, and performance characteristics that befit a world-class flagship sedan. Reimagined in every way, the K900 brings with it an array of new systems and safety features, making it the most technologically advanced Kia ever. "The all-new 2019 K900 is much more than a generational redesign, as it takes on a whole new look, feel and character over its predecessor. Only its name – K900 – is carried over," said Orth Hedrick, vice president, Product Planning, KMA. 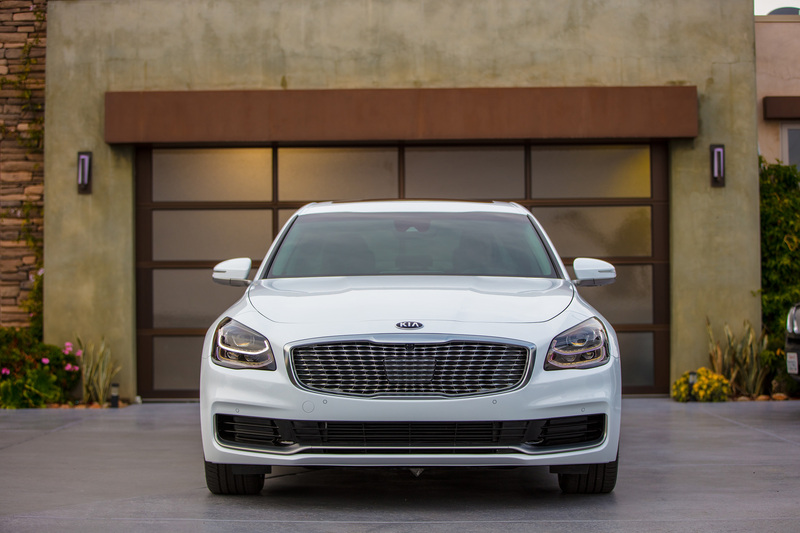 "Our designers and engineers have done an extraordinary job of reimagining the K900 to fully meet the needs and desires of consumers shopping in the luxury sedan segment with the promise of a tremendous value proposition that only Kia can deliver. The all-new K900 is a push into new territory and serves as further evidence this brand is moving in a forward direction." Conceived and created in Kia's design studio in Korea with collaboration from the Irvine-based California studio, the new K900 is slated to go on sale in the U.S. during the fourth quarter of 2018. Pricing will be announced closer to the K900's on-sale date2. Sophisticated and stately, the entirely redesigned K900 brings a new definition of premium luxury to the Kia portfolio. Although it's slightly longer and wider than the outgoing model, this K900 actually looks tighter thanks to its reimagined proportions, especially with respect to its profile. Combining a beautifully balanced design with flowing lines, tensioned surfaces and geometric details, the K900 introduces a modern air of elegance to the large sedan segment. Kia's designers were inspired by a design ethic they call 'The Gravity of Prestige,' and this all-encompassing philosophy translates to a feeling of solidity and volume in the upscale space. Based conceptually on the ever changing shape of condensed energy, a new 'Quadric pattern' signature grille is the focal point of the K900. There are 176 jewel-like 'cells' within the grille, suggestive of released energy accelerating away from its center in the way ripples in water move away from the impact of a splash. Natural flowing lines emanate from this frontal area, rise over the hood, sweep through the flanks and culminate at the rear. In profile, a satin chrome flash adds depth to the smooth bodywork, running along the base of the doors and around the lower rear section of the K900 to pull your eyes downward to the car's large and detailed 19-inch wheels. The brightwork along the window-line adds a degree of structure to the rich and exaggerated C-pillar design before it merges with the rear deck. Overall, the K900 is equal parts prestige, power and presence, embodying an appearance reminiscent of a finely tailored suit over an athlete's well-proportioned physique. Elegant by design but with a minimalist layout, the interior of the new K900 provides drivers and passengers with a peaceful retreat that is simple, modern and comfortable. The cabin wraps around the driver, enhancing the sense of being cocooned from the outside world. A tight and virtually uninterrupted line between the doors and the instrument panel creates a deliberate sense of continuity. Flowing from the center of the dash and outward to the doors, surfaces are trimmed in a sophisticated combination of materials, with metal veneers and a choice of four open pore matte wood selections – Walnut, Brown Olive Ash, Beige Olive Ash and Engineered Wood. Soft leather balances the cabin's harder natural surfaces in Black, Beige, Espresso Brown or two-tone Sienna Brown. Kia's definition of luxury is not limited to the privileged, but there is a distinct feeling of exclusivity achieved by tasteful accents throughout this space. The handsome dash is uncluttered and ergonomic, featuring a tech-savvy instrument panel and integrated air vents. The driver helms the car with a heated leather steering wheel and a matching center console-mounted gear shift knob. The leather-trimmed premium seat design achieves the ultimate in luxury, exuding a substantive look and feel as well as a high degree of durability thanks to extreme validation testing in the areas of UV, temperature and humidity. Premium Nappa leather also is available. The seats are well-contoured and shaped to deliver maximum support and comfort while minimizing fatigue for occupants, whether the K900 is straight-line cruising over a long distance or moving ambitiously over curvy country roads. The quilting on the seat "shoulders" is to invoke the spirit of clothing worn by Korean kings throughout the country's rich history. To further elevate the mood, the K900 features interaction lighting thanks to an Intelligent Lighting Control system that uses proximity sensors to brighten 20 percent when the driver's hand is sensed reaching for a switch on the dash. Although the K900 prides itself as not being overtly luxurious, the one nod to the haute lifestyle is an analog clock specially designed and co-branded by Maurice Lacroix4 , a symbol of globally renowned sophistication and the pursuit of perfection in craftsmanship. This eye-catching timepiece is set in the center of the dash and tangibly elevates the prestige level of the cabin. 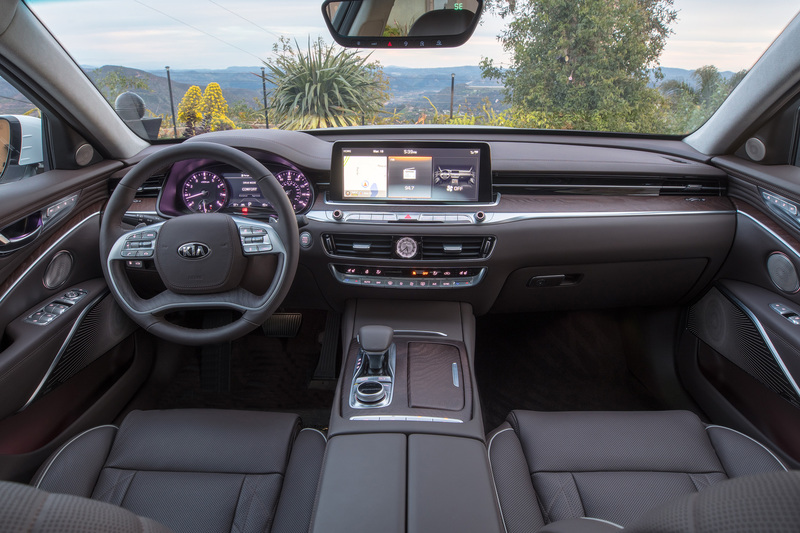 As expected, the all-new K900 comes equipped with a wide array of advanced technology, connectivity and infotainment features. The center console features a tactile port dial that is both convenient and intuitive for driver operation of the 12.3-inch Human Machine Interface (HMI) touchscreen that displays maps, trip information, audio sources, climate controls and more.5 A newly designed, modem-based Premium Navigation6 system comes equipped with enhanced user-friendly features accessible via Kia's UVO luxe1 sub-brand, dedicated exclusively to K900 owners. UVO luxe1 offers a full suite of remote features through an embedded modem in the vehicle and accessible once the UVO account is created on the myUVO.com website and the vehicle is enrolled. UVO luxe1 telematics features can be used from the desktop, tablet, or dedicated UVO luxe1 app, and all three access points allow remote start, setting of preferred cabin temperature, or easy to use features, such as Find My Car. K900 owners are also provided with a dedicated service representative reachable through a VIP phone line. There's also full connectivity via Apple CarPlay7 and Android Auto,8 and additional convenience comes from a wireless cell phone charger9. When piloting the K900, the driver will benefit from either a high-resolution seven-inch color TFT instrument cluster or an available 12.3-inch color TFT instrument cluster with graphics differentiated by the selected drive mode – Comfort, Eco, Sport or Custom. Beyond the gauges, there's an available 9.7-inch Head Up Display (HUD)10, teeming with content related to speed, navigation, audio, and driver assistance systems that allows the driver to focus more of their attention on the road ahead. As part of Kia's Advanced Driver Assistance Systems (ADAS)11, the K900's Surround View Monitor (SVM)11 utilizes four cameras providing a 360-degree perspective with stitched images that provide a seamless view. Blind Spot View Monitor (BVM)11 provides the driver with a live video feed of adjacent lanes in the instrument cluster and is activated via the turn signal. Utilizing the blind spot sensors, the K900 also enhances visual awareness by offering a haptic steering wheel10 that can help alert the driver by way of vibration in the event of a potentially unsafe lane change if the vehicle senses the presence of another vehicle or object. A fully immersive driving experience is only complete with proper acoustics and the K900 delivers premium sound through a 900-watt 17-speaker Harman Kardon/Lexicon14 system, Kia's most powerful audio system ever, featuring QuantumLogic15 Surround Sound technology and Clari-Fi16 technology. QuantumLogic15 extracts signals from the original recording and redistributes them into an authentic, multidimensional soundstage for playback that is clear, refined and full of detail. QuantumLogic15 also offers selectable modes including Stereo Mode, Audience Mode and On Stage Mode, which highlights 360-degree instrumentation that will make listeners feel like they are on stage with the performing artist. Simultaneously, Clari–Fi16 works in real-time to rebuild audio details lost in digitally compressed music. 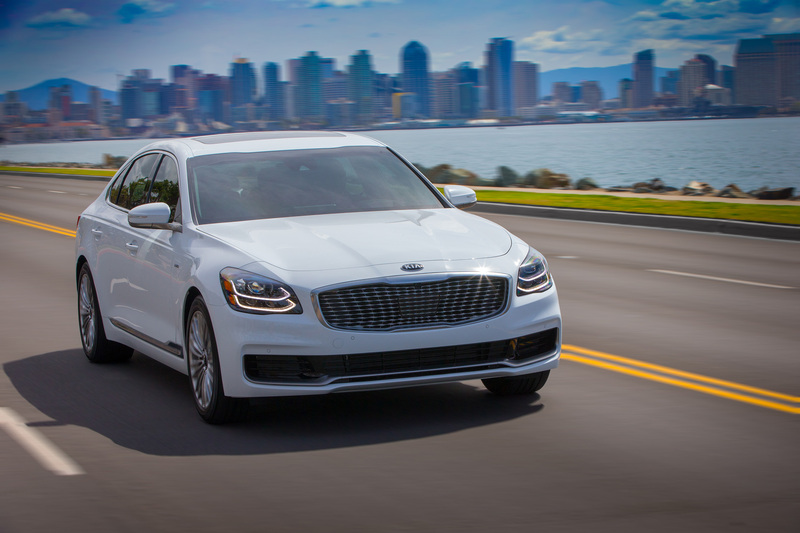 The K900 has evolved into a truly sophisticated driving machine powered by a 3.3-liter twin turbo V6, the same engine found in the automaker's highly acclaimed Stinger fastback sport sedan. This world-class engine outputs 365 horsepower17 and 376 pound-feet of torque and was recently named to Ward's 10 Best Engines list for its exceptional responsiveness and refinement. The twin fast-spooling single scroll turbos are integrated into the exhaust manifold for enhanced durability. Dual Continuously Variable Valve Timing (CVVT) works seamlessly in tandem, resulting in optimal and instant power delivery. Since turbo engines typically generate more heat than non-turbo engines, a robust cooling system was required. To meet the challenge of extreme environments, Kia's development team exceeded internal targets and over-engineered a system that utilizes a wider radiator for more efficient cooling and airflow, and adopted a high-capacity 600-watt brushless electric fan motor. Aiming to provide the highest level of quality and durability, Kia conducted testing and validation in extreme environments all over the world. The sedan's performance equation was further honed with a number of enhancements under the direction of Albert Biermann, president of Kia's Vehicle Test and High Performance Development. 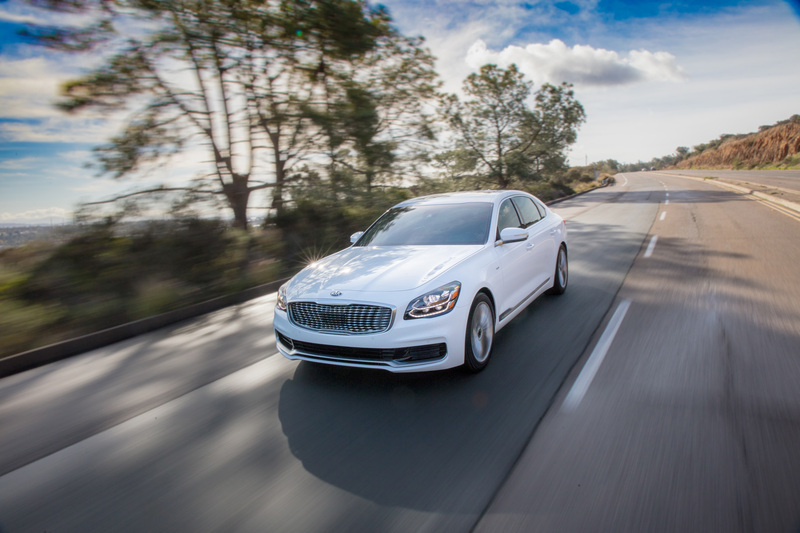 "The goal for the K900 was to achieve 'confident comfort' on the road," stated Biermann. "To deliver this result, we focused on four main categories: drivability, NVH, comfort and steering precision." Aerodynamically, the K900 utilizes a wheel air curtain to minimize vortices inside the wheel arches by introducing air from the bumper. In addition, full underbody panels reduce air drag by "straightening" airflow below the vehicle. And an active air flap further reduces drag depending on driving speed. The end result is a drag coefficient of .27 Cd. For a large car to enjoy precise handling and a sense of nimbleness is no easy task. To that effort, the K900's four-wheel independent suspension geometry, including a new front multilink design, is aimed at delivering tighter, quicker turn-in for a more athletic and spirited driving experience. The system is designed to improve driving stability and steering agility by increasing stiffness of the front and rear axle assembly. An available Electronically Controlled Suspension (ECS) is tuned to maximize driving pleasure and increase performance. ECS helps to reduce variations in wheel load, complimenting traction and reducing chassis motions. An internal damper system utilizes wheel acceleration sensors to detect rough roads and responds by modulating the suspension setting accordingly. The K900 utilizes an electromechanical, rack-mounted power steering assembly designed to increase agility and comfort. Equipped with standard variable ratio steering, the system delivers a "slower" off-center feel, which provides a better sense of stability, especially during high-speed driving. Smooth and linear stopping force with definitive confidence is the result of a front four-piston brake caliper design in combination with a rear two-piston brake caliper setup. Underbody cooling ducts guide air to cool the brakes and enhance performance. The system features standard Corner Brake Control and Brake Fade Compensation, which are designed to automatically increase hydraulic pressure in the braking system as the rotor temperatures rise to maintain a more consistent brake pedal feel in certain circumstances. This results in a more linear stopping feel. There's also a brake drying feature that can periodically apply the brakes (undetectable to the driver) to sweep water build-up and maintain consistent performance in certain conditions. The all-new K900 will be built in South Korea at Kia's Sohari premium manufacturing facility, shared with the Stinger. 13 Safe Exit Assist is not a substitute for one's attention and may not detect all objects surrounding the vehicle. Always pay attention to traffic and to the area around your vehicle when exiting the vehicle.